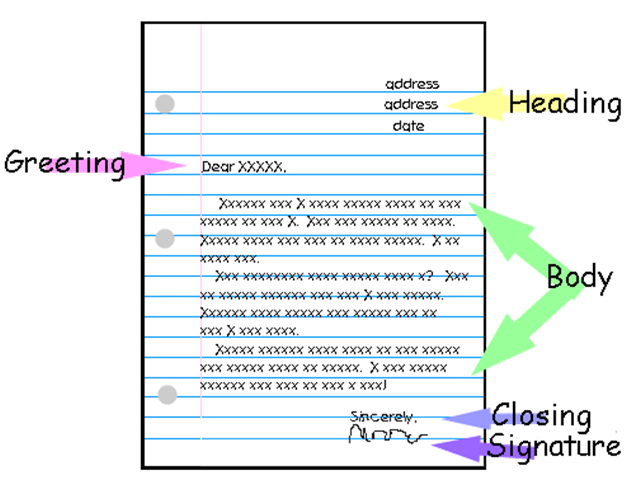 A friendly or personal letter has 5 main parts. HEADING: Includes the address and the date. In some cases, it is OK to just write the date. 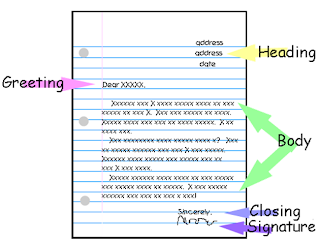 GREETING: The greeting usually starts with 'Dear' and is followed the person's name and then a comma. CLOSING: The closing includes a short capitalized expression such as 'Sincerely' or 'Love' and is followed by a comma. Skip a line after the body before writing your closing. 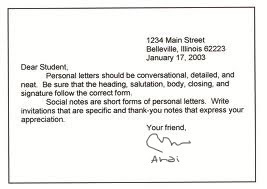 Sometimes you may add a POSTSCRIPT at the end of your letter. You write P.S., add a note and then end it with your initials.